Ms. Vidovic continues to broaden her repertoire and captivates audiences around the world with her global touring in the 2010-11 season. Following performances in Poland in Summer 2010, Ms. Vidovic began the season with a tour to Reunion Island (France) and Mauritius in the Indian Ocean. Her schedule, internationally, continues with concerto appearances with the Romanian Radio Symphony in Bucharest, the Zagreb Soloists in Japan and recitals throughout Japan and at festivals in Brazil, Germany, Netherlands and Scotland. Ms. Vidovic’s U.S. concerto engagements this season include the Missoula, Tacoma and Westmoreland symphonies. Her recital schedule in the USA is highlighted by her debut recital at New York’s 92nd Street Y. She also performs recitals at The Strathmore (Bethesda, MD), Baltimore, Washington (DC), Jacksonville, Greensburg (PA), Boston, Clarksville (TN), Kansas City and Salt Lake City. Highlights of Ana Vidovic’s 2009-10 season included tours to Korea and Colombia, with stateside engagements including recitals in Pensacola (FL), Baltimore, Austin (TX), Brookville (NY) and Erie (PA; and a concerto performance with the Asheville Symphony conducted by Daniel Meyer. She has also performed as soloist with the West Virginia Symphony, among others. Ms. Vidovic has won an impressive number of prizes and international competitions including first prizes in the Albert Augustine International Competition in Bath, England, the Fernando Sor competition in Rome, Italy and the Francisco Tarrega competition in Benicasim, Spain. Other top prizes include the Eurovision Competition for Young Artists, Mauro Giuliani competition in Italy, Printemps de la Guitare in Belgium and the Young Concert Artists International Auditions in New York. In Croatia the guitarist has performed with the Zagreb Soloists and the Zagreb Philharmonic Orchestra and with Symphony Orchestra of the Croatian Radio and Television, as well as having been featured in three television documentaries by the eminent Croatian film director Petar Krelja. 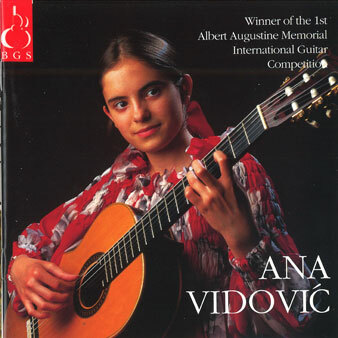 Ana Vidovic comes from the small town of Karlovac near Zagreb, Croatia, and started playing guitar at the age of 5, and by 7 had given her first public performance. At the age of 11 she was performing internationally, and at 13 became the youngest student to attend the prestigious National Musical Academy in Zagreb where she studied with Professor Istvan Romer. Ana’s reputation in Europe led to an invitation to study with Manuel Barrueco at the Peabody Conservatory where she graduated in 2005.